GANGNEUNG, South Korea — Dog meat restaurants are cooking up their traditional specialties despite government pressure and financial incentives aimed at curbing sales during the PyeongChang Olympics. 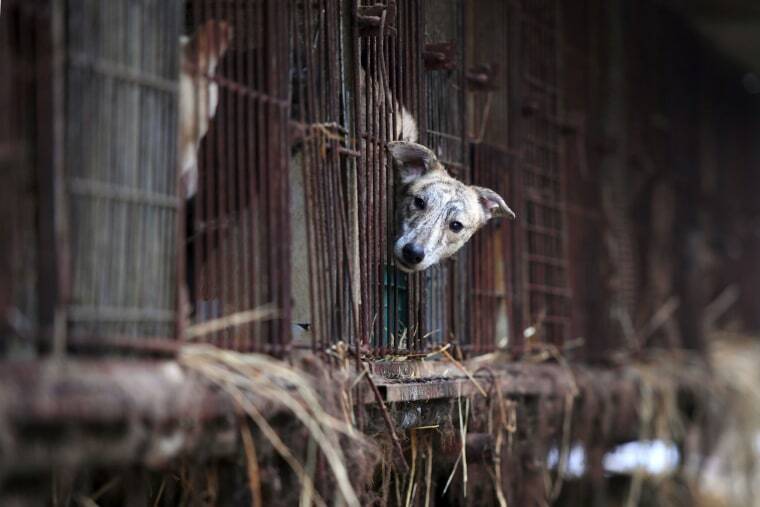 Consuming dog is largely unpopular in modern South Korea and has become increasingly taboo. But "bosingtang" — literally “invigorating stew” made with dog meat — still appears on some menus. But the South Korean government has long known that eating dog is frowned upon by many foreigners. Before the 1988 Seoul Olympics, the government restricted the sale of dog meat in parts of the city. Preparing for an influx of overseas visitors for the Winter Games, officials last year offered restaurants 2 million won (around $1,850) to remove any mention of dog meat from their signs and to stop serving it. “The government doesn’t want tourists to be offended by it,” PyeongChang County official Lee Yong Jae told NBC News. Lee said two restaurants there took the deal, but lost business so started selling dog meat again. Ms. Choi runs a restaurant within walking distance of Gangneung Station, where locals and foreigners arrive daily from Seoul on a new high-speed rail line built specifically for the Olympics. She said she only heard rumors about the government’s efforts from customers and other shop owners. But she said the offer, which Gangwon Province took off the table on Dec. 31, wouldn’t have been enough to convince her to change her signs or her main course. Choi, who declined to give her first name, said she’d wanted to open a dog meat restaurant since she was a child, when her parents cooked her bosingtang. Choi is proud of her restaurant. “Cows also cry when they go to slaughter," she said. "So why do people hate eating dog so much?" Choi said she heard that one restaurant in Gangneung took the deal and started selling goat stew instead of dog, pronounced “gae” in Korean. But the words "bosingtang" and "boyangtang," a variation, only appear to be an issue when South Korea hosts a major international event. The rest of the time, only animal rights groups draw attention to South Korea’s dog meat industry. During the Olympics, the Humane Society International and local group Korean Animal Rights Association are working together to publicize the dog meat trade in South Korea. They’ve been touring a “virtual dog meat farm,” a mobile photo exhibition on a truck now parked outside Seoul City Hall. These days few people aged under 40 eat dog, according to Joo Young Ha, a professor at the Academy of Korean Studies and an expert in Korean anthropology. However, he said it remains popular among elderly people living in rural areas. Joo said the government’s restrictions on dog meat in 1988 imposed to appease foreigners fueled patriotism among some Koreans, who actually began to eat more of it. At that time, Joo said, dogs weren’t kept as pets. But Western trends began taking root in the 1990s, and the distinction between meat dogs and companion dogs narrowed, according to Joo. Today, livestock has largely become pet. Even without outside pressure, the future of some restaurants in Gangwon Province — the region in northeast South Korea that is home to this year’s Olympic venues in PyeongChang County and Gangneung City — appears uncertain. “We don’t have too many customers, but everyone [in Gangneung] knows us,” said one shop owner, who asked to remain anonymous. Her few clients, all middle-age or elderly, sat around steaming bowls of stew. As a proud Korean, restaurant owner Park Kyu Dong said he would have changed his signs if it could help the Olympics. However, he said the government didn't call back after initially making its offer. Park, in his 70s, is hanging his hopes for the future on unification of the two Koreas. “Bosingtang is a popular dish in North Korea,” Park said. “If we unify, there will be plenty of people to eat it.